Each of the specimens pictured in the grid pattern below were injected with 3H-thymidine on the days indicated. All specimens were killed on postnatal day (P) 60 with an overdose of pentobarbitol and subsequent perfusion with 10% neutral formalin. The brains were blocked in the sagittal plane, were placed in Bouin’s fixative for 24 hours, then transferred back to formalin until embedding in paraffin. Serial 6 µm sections were saved from medial to lateral. 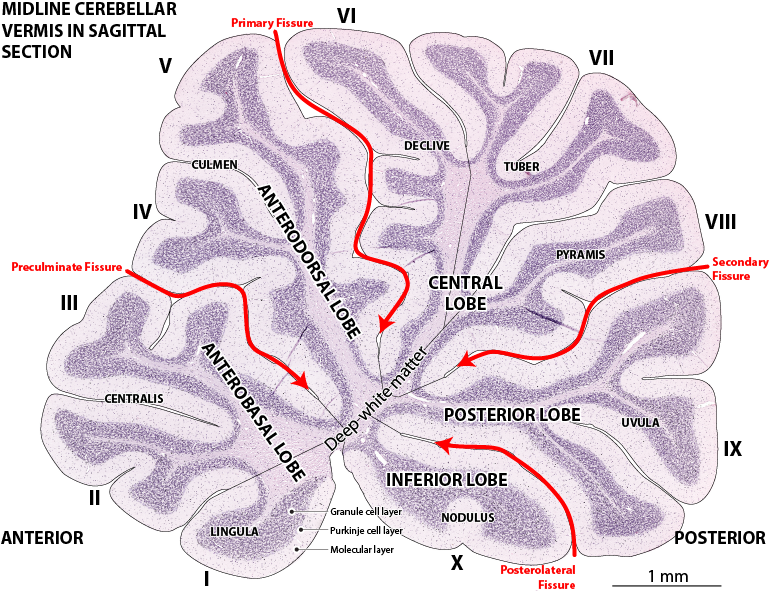 Here we show sections of the part of the cerebellum that spans the midline: the VERMIS. The labelled cells are easily identified by the small black dots overlying the nucleus. The precursors of these cells absorbed the injected label, incorporated it into their DNA, and have retained that label throughout their entire lives. We analyzed the proportion of labeled cells that ocurred after the onset of each injection series. Because of the multiple injections used, our assumption was that all labeled cells were formed AFTER injections began, unlabelled cells were formed BEFORE injections began.There are complex labelling patterns in the thick granule cell layer and in the molecular layer. Most of the neurons in these layers are generated postnatally.By clicking on the grid of thumbnail sections below, a new window will open and you can view the section at high magnification with high resolution cellular detail. The labeled photo above shows the different parts of the cerebellar vermis, with all the 5 lobes, lobules (Roman numerals I-X and names), and 4 separating fissures. These structures are nearly the same in all of the photos, so only one section is labeled as an example. To download a copy of the labeled section, click on the link below for the pdf file.